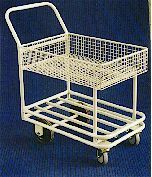 The wire basket trolleys are suitable for a number of uses such as file and mail handling. They all consist of a steel tube frame with two fixed wheels and two swivel castors, and a wire mesh basket fabricated from 25x25x3mm wire mesh. The rear wheels are set forward of the handle giving a shortened wheelbase for quick response when turning, accurate steering and ease of negotiating obstacles such as gutters. 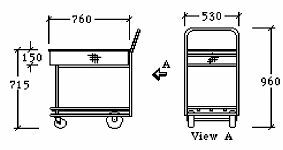 The details of individual trolleys are shown below. This trolley is fitted with 2 swivel 125mm castors and 2 fixed 200mm wheels. It is finished in grey powder coat. It also has a shelf over the wheels set below the edge of the frame so that this space can be used and boxes do not fall off. This trolley is designed for handling files and sorting mail. It has the same frame and wheel arrangements as the TX/039, but the basket is a different size and mounted higher to eliminate bending. It is finished in grey powder coat and the dimensions are as shown. The TX/041-DS is made to the same size and specifications as the TX/041 wire basket trolley, but has one side of the basket made to fold down. This allows heavy or awkward items to be more easily loaded, the side can be lifted up and locked into place so that the contents can be moved without risk of them falling out. The trolley can be supplied with or without corner buffers.